Maximum's Marconi station is our most complete, all-digital home weather station. Offering a dramatic display of current conditions, as well as historical data for everything from wind chill to high tide. 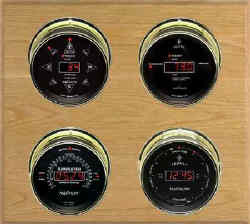 Marconi includes the Merlin, Mystic, Rainwatch and Cronus instruments on a solid Oak or Mahogany panel. Available with wired or wireless instruments.